English is a very rich language, and many English words are difficult to translate into other languages. In this vocab spotlight series, we will break down the meaning of those difficult-to-translate words. 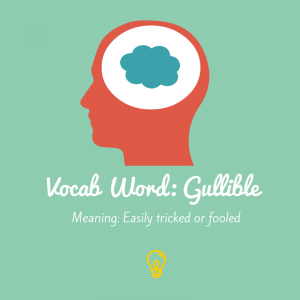 This month’s word is gullible. Have you ever made up a story about why you didn’t finish your homework? If the teacher believed your story, you could call him or her gullible. Have you ever played a joke or prank on someone? Maybe you convinced your little brother that chocolate is made out of dead bugs. If he believed you, he is gullible. Get it? A person who is gullible is a person who is easily tricked or fooled. She is so gullible that she still believes in Santa Claus. He is so gullible that the car salesman got him to pay twice the car’s value. The gullible man wrote a check for $100 to a fake charity. In conclusion, gullible people tend to believe whatever they are told. How about you? Do you know anybody who is gullible? Have you ever been fooled? esl-blog BridgeEnglish, english language, english vocabulary, gullible meaning, learning English, translation, Vocabulary Spotlight Series. permalink.